Today, I want to share five simple tips on how to write a blog post that will draw in your readers. 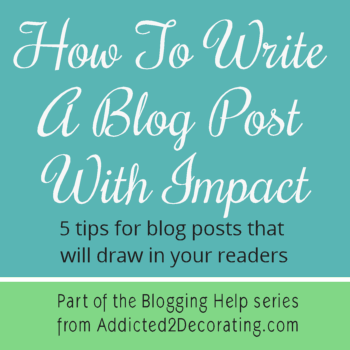 Let me preface by saying that these tips are for bloggers who are in a home, decorating, DIY, or other creative niche who write posts that are very picture-heavy. I’ve been blogging now for six years, and the way I write posts now is completely different from how I started out writing posts as a newbie blogger. Now when I look back on those old posts, it’s not hard to understand why I had a hard time gaining a following in the beginning. Those posts had no impact…nothing to draw readers in. So here are five of the tips and tricks I’ve learned over the years about how to write a blog post with impact, and it shouldn’t surprise you that four of the five tips have to do with pictures!! 1. Put your first picture as close to the top of the post as possible. When visitors arrive at a post on a creative niche blog, they want pictures. That’s all there is to it. Just like when you buy a shelter magazine, you’re not looking for wordy articles, you’re looking for pictures. So give your visitors what they want by placing your first picture as close to the top as possible. In fact, if you can have your first picture visible (even if it’s just partially visible) on the post without having to scroll down the post, that’s even better! I haven’t always done that on my own posts. In fact, it wasn’t until I really started analyzing the blog posts of the most popular and highly-trafficked blogs in my niche that I finally clued in on this tip. So now, I try to do this on every single post when it’s possible. 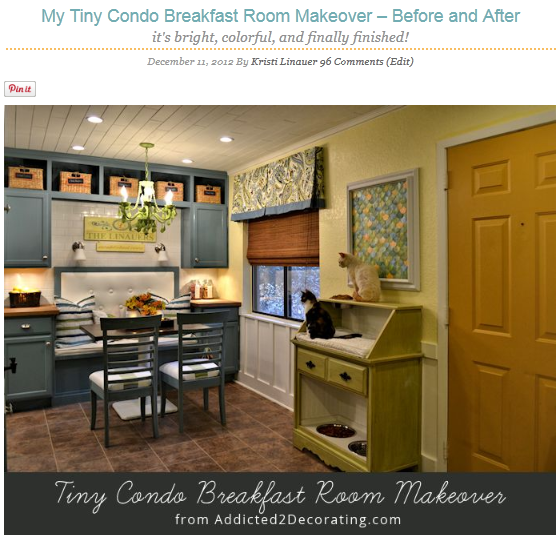 Here’s a look at my last room reveal post…my condo breakfast room makeover. The picture is the very first thing in the post to draw in the reader. Now I don’t meant to imply that you can’t have a paragraph before the first picture, but I personally try not to ramble on and on, paragraph after paragraph, before I insert my first picture. If I put a paragraph before the first picture, I try to keep it as short and to-the-point as possible. 2. Put your absolute best picture first. When I was a new blogger (and actually, even three or so years into my blogging), I wrote my posts with the mindset of saving the best until last. When I wrote room reveal posts, I thought that starting off with the worst, and then ending with this big “taa-daaaaa!! !” was the way to really draw readers in. Again, it was only after studying how the really successful bloggers in my niche wrote their posts that I realized that putting the absolute best picture first was the way to draw readers in! 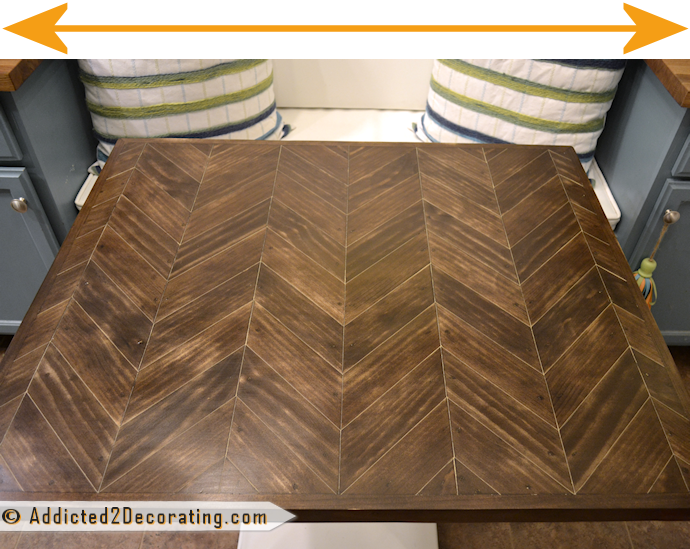 Here’s a side-by-side comparison of my latest room reveal (again, my condo breakfast room makeover), and a room reveal that I did in March 2011 of a colorful dining room makeover. See how much more eye-catching the one on the left is? Contrary to how I used to think, starting with the best picture actually draws readers in. If you start with a bland picture, like the post on the right, people may or may not stick around. In fact, on that post, readers have to scroll through several “before” pictures, plus a mood board, before they ever get the actual room reveal. There’s nothing to grab readers’ attention from the get-go. In other words, if your blog content area is 500 pixels wide, then make your horizontal pictures 500 pixels wide. If your blog content area is 650 pixels wide, then make your horizontal pictures 650 pixels wide. You can actually make your pictures just a big narrower if you like the look of having a margin on either side of your pictures. And when it comes to vertical pictures, you can definitely make them narrower if you want, but just still make them BIG. I personally don’t like to have to scroll to see the top of a vertical picture, and then scroll down to see the rest of the picture. I like for one picture to fit completely on my screen on my laptop so that I can view the entire thing without scrolling. But there’s no hard and fast rule here. Just keep in mind that if you’re blogging in a creative niche, people are coming to see your PICTURES, so give them what they want. Fill up that space! See how nice and big that picture is? See how much room I’ve left (or haven’t left) on either side of the picture? It gives readers the ability to see the details of the pictures without straining their eyes. Now how interesting would it be to write post after post after post with pictures that looked like this? I’ll say it. Posts like that are incredibly boring. I seldom return to blogs that use pictures like that in their posts, and I never feature projects from bloggers who use small pictures in their posts. 4. Have at least one final picture that is free of fancy typography, overlays, etc. There seems to be an epidemic in the creative niches lately of posts overloaded with pictures that have wording, fancy overlays, frilly design, eye-catching typography, and more on them. I get it. I really do. We all want our pictures to be pinned, and we want the pinned pictures to be amazingly eye-catching so that other pinners will see them immediately, re-pin them, in be so blown away by our amazing typography skills that they’ll be drawn to our blogs like moths to a flame. So I get that. But there’s no need for every single picture in a post to contain that stuff. Make one or two fancy pictures with overlays and colorful typography for the pinners, and then include several clear, full shots of your project or room that is free of all of that distracting stuff (notice that I’m not including watermarks here…I’m all for watermarks) so that people can just focus on and appreciate the project itself. And can I share a secret? You might even find that your project will be featured more on other blogs and websites if you will make available at least one (preferably two or three) big, clear pictures of your project that are free of the fancy typography and overlays. I personally do not feature projects on my blog if all the blogger has available are the typography-heavy, fancied-up pictures of their projects. And I know I’m not the only one. Have you ever seen those types of pictures featured on Apartment Therapy? So again…one or two fancied-up pictures for the pinners, and then in the rest of the post, let the project speak for itself. Oh, and on a related topic, be sure that at least one or two of the non-fancied-up pictures is actually of the entire project…a full view of the project. In other words, don’t have the only full-length or full-view of your project be the fancied-up, typography-heavy picture, and then the rest of your pictures be close up, detail, artistic-type pictures. Does that make sense? Have you ever noticed how newspaper articles are written? Newspaper writers use short paragraphs, generally with two or three sentences (four or five at the most) per paragraph. I highly recommend doing that on your blog as well. Want to drive you readers absolutely mad? Use a small font on your blog posts, and make the entire post one long paragraph. Those types of posts are just hard to read. Previous Post Let's Tour The 2013 HGTV Dream Home Together! Thanks for all the great advice! I’ll definitely be implementing some of these tips! Kristi- I just love your blog tips, if not something new to learn it/s a great refresher. You are so kind to share and impart your knowledge to others. Thank you – I agree with all of your comments. I do have a tendency to be wordy and to start out with the really bad image moving toward the much better after image – this gives me some ideas of how to do this type of blog better. I am not certain what you mean by fancy typography and overlays – maybe because I don’t know how to do them. I’m currently redoing my blog — moving old content to a new address, and will definitely use some of your tips as I reformat. Obviously, with some of the older things, I’m stuck with whatever pictures I have as there’s no going back, but you’ve definitely given good food for thought! Thank you! I don’t have a blog but I follow lots of blogs. You are correct on all counts. I have to add regarding the pictures that for iPad users the iPad theme for blogs does not allow us to enlarge the picture to see it better on this smaller screen. So many people post small pictures that are just impossible to see on the iPad themed blog (which lots of blogs have switched to and it’s not always to find the button for regular web version). Likewise I rarely read every word written unless it’s a tutorial for something I want to make. I mostly just look at pictures to figure out if I’m interested in more detail. Thanks for the tips Kristi. I do most of these, my pictures are usually big but they could be bigger! I’m going for it! Thanks for your great advice. I am new to the blogging world and am still trying to figure out all the widgets in WordPress. It seems that I can’t always make the photo larger if I am using a photo from another photographer (with credit of course). Please keep your suggestions coming, they are so great. It’s definitely not always possible to use really large photos if you’re using another blogger’s photos. If they’ve resized their photos to 500 pixels wide, then that’s pretty much as wide as you can go, even if your own content area is 700 pixels wide. If you try to make a 500-pixel-wide picture fill up your 700-pixel-wide content area, the photo will look grainy and unclear. So unfortunately, if you feature other people’s photos regularly, you’re kind of stuck with what they provide. 🙂 But at least you have full control over your own photos! You’ve described me as the blog reader perfectly, i love lots of great, big pictures and super long, drawn out paragraphs are really difficult to get through! Thanks for sharing such great tips Kristi! I’m not an expert on this…haha! But, I believe that for getting good SEO it’s necessary to have a sentence or two before the first photo. You might want to look in to this a bit more. Thank you Kristi for your insight. Always appreciated!~ and I will keep it in mind when creating my next blog posts. I appreciate the fact that you are so supportive to new DIY bloggers and share your wealth of knowledge. I know photo quality is a big issue for me as I am learning how to post on WordPress.org. The idea of adding full width pictures would make it much easier. I have a few posts currently in draft and I am going to reformat them accordingly! Thanks for the info! These are fantastic tips. I’m glad I got them from you before I ever started my blog. As far as the small paragraphs go, I really thought that was just me! I’m very easily bored and rarely read the whole blog if it’s long. Another pet peeve is putting pictures through a filter…at least that’s what I’m guessing they do. Some of the photos are so washed out I can’t pick out any detail. Or sometimes they give them a washed out border. These eyes are 53 years old and not getting any younger! lol! It’s too hard to see! Thanks for your suggestions and I they’re heeded by others…they’re spot on! Thank you for all your advice. If only every design and DIY blogger would read this and follow your tips, the world would be a more fun place! I like to use big photos, too, but I am concerned that too many large photos slow the loading time. I guess the trick is to select only the best ones and make them big. I don’t understand the logic of using multiple shots of a project or a room that are almost identical, something you never do, thank you! About the placement of words above or below a photo, I try to make my kick-off photo a vertical one so that I can begin both words and photo at the top of my page. I’ve noticed that if I use a caption on that photo (in Blogger), the caption gets bumped up to the lead sentence in a Google reader. It’s a dilemma, so I try to make the caption a grabber and SE0-appropriate, as well as the intro phrases of the text itself. I don’t know if this is the best solution or not. It’s not always easy. My favorite source for better blog writing info is Copyblogger. The writers there always endorse “deep captions” on the theory that people will usually read captions when they scan photos. That calls for interesting and full sentences for captions — not just phrases or labels. Great post. Thanks for being so generous with us. The trick with the photos is just to make sure that the actual files aren’t massive. If you’re using pictures that are small files at 72 dpi, it shouldn’t slow down the page load times. Chris in comment 5 mentioned that she can’t go back and fix old photos. But I have done just that. Of course it’s usually impossible to re-shoot poor photos of a project in transition or a “before” shot. But you can go grab them, edit for contrast or better composition or better color, resize them and put them back up. I’ve also gone back and beefed up some early, pathetic posts from over two years ago posts — breaking the writing into smaller paragraphs, adding subheads, tweaking a word here and there for livelier copy. Why not? I think that’s a great idea, Barbara. I’m hoping to make that a priority for my own blog this year. I’ve got lots of older posts that have good content, but they’re just written all wrong, and they don’t have that main, first, draw-you-in photo. Hopefully I can remedy that this year. Great tips! Always good to be reminded. Great article. 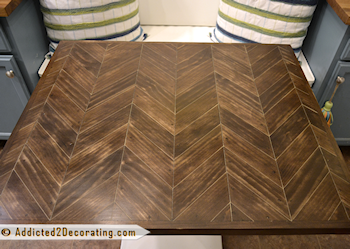 I don’t write a decorating blog but you have made some good points for everyone that blogs. I love that cabinet that the cat is sitting on. Where did you find it? Great tips! I don’t blog, but I read blogs. I agree with everything you say here. I remember when you remodeled my bathroom a few years ago. A writer for a local magazine came out to take pictures and interview both of us. She had a recorder going the whole time. I was immediately so disappointed when I opened the magazine to the article. At the bottom of the first page, AFTER much dialogue, were three small pictures. The top two were before pics. The after pic was at the very bottom of the page, not featured at all. The article was too wordy, going on for several pages and very boring. She must have written word for word from her recording, making it hard to follow since there was no picture of what was talked about. The writer should have used the points you made here! Same principles! In the same magazine another writer had an article about a room in another house. There was a beautiful full page picture on the left of the finished room. The article was shorter and included more pictures that were large, although not full page. Great article! Wish ours had been. I can see all this playing out in blogs, too. Wow thanks for the tips Kristi. Your #2 was spot on. I had been struggling with where to put the best photo. All of your tips are super helpful being a new blogger with only 20 posts under her belt. I strive to not make the mistakes of others since I’m starting off so late in the game. In the future if you have not already, can you do a post explaining the whole SEO thing. It’s greek to me. Thank you for all your posts on how to blog better. This one is very good, I already do most of what you say…except for the size of the font. Using Blogger, I often wonder if the next size up is too large, so I’ve been afraid to use it. I would love your opinion on it, if you have a chance. Do you think my font is too small right now? Should I go to the next size up…even if it looks too big to me? Thanks for all your help with your posts over the last months. Yep, I think you should go up to the next size. 🙂 It’ll seem strange at first, but you’ll get used to it. Thanks Kristi, I have changed a slew of posts up. It’s funny, because when you see it on the blog, it doesn’t look near as big as when you are looking at it in the edit page. Looks great, Debbie! So much easier to read! I want to thank you for the great blog post advice. I started using all five tips on my posts and with each post I am getting more and more views. It has definitely improved the look of my sites. It is much easier to read and less cluttered. I am looking forward to a post on how to do a video post. I have tried but it didn’t work out the best. Once again I want to thank you for helping us newbies out so much! It is just so generous of you to share all of your knowledge. I always learn something from you,and to be honest, you are one of the only big blogs that I read that is so helpful. Don’t know what I would do with out you! This is a really great post 🙂 I’m proud to say that I do most of these things with my blog. Thank you for offering so freely your knowledge and experience. Thank you Kristi! I just found your blog today. Really excited about finding it. I have been looking for information like this, as I am new to blogging. I am retiring soon, and in my todo bucket, is to learn how to be a better blogger AND be a consistent blogger! views of all colleagues concerning this paragraph, while I am also zealous of getting knowledge. Super post! Love all the fantastic tips-thank you!